Buy your very own copy of the 2010 edition of this meditation book. A Sample meditation can be found on the right. Each day's meditation is taken from the readings of the day and includes a daily prayer and mission activity to help you grow in your relationship with God. This prayer book has been written by David Babbington. David has worked for many years as an evangelist throughout the United Kingdom, delivering many conferences, missions and talks to schools, parishes and groups within the Anglican and Roman Catholic communities. He now works as an evangelist is the parish of Saint Francis, Friar Park in the West Midlands, as well as working to support the Additional Curates Society. 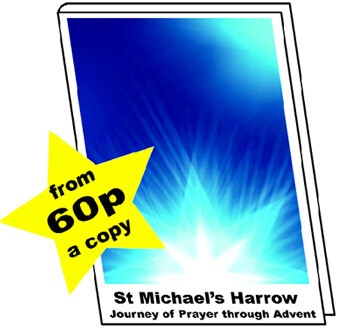 Alternatively click on the booklet image and order direct from the ACS website. This addition to your advent preparations is one not to be missed! If you were to ask what Christmas is about, it can be summed up with one simple word, "Love". It's a word we bandy about without ever realising the power of what it means. "I love that" "Isn't that lovely?" "I love it here", "Love that tie", "I love this song" - Is this what we mean when we talk about the gift we receive at Christmas? No, it's something much more powerful. It's a love that heals, a love that cares, a love that understands and a love that touches the very core of your being. Wow, what a gift! But not just that.... it's a free gift just for you! But wait a minute, it's much more than that. It's so powerful that it shines out from you to everyone you meet, helping you to love those close to you and also those you know are far from you, physically, spiritually and emotionally. It breaks down walls and barriers if you will only let it. Love is more powerful than you think and God is generous in how much he gives you. If you already have His Love, imagine what you will be like if you as him for more everyday until Christmas. Well, why not try?